Why is so much written about Jesus every year? Most of what will ever be written about Jesus has been done. There are just not many directions left to go. So when popular books about Jesus by Bill O’Reilly and Reza Aslan come out just several weeks apart, how are they selling so many copies? Even if Santa and the Easter Bunny sells toys and candy, Jesus will sell you books, movies, and television advertising dollars. The brand of Jesus is massive and since it has no copyright anyone can plaster it on a book or movie title. The controversy alone will sell a few copies. Bill O’Reilly is not a biblical theologian, scholar, or historian. Reza Aslan is none of those, nor are either scholars of religion. Yet both have equal credibility in the marketplace of Jesus. At least Aslan seems to have written his book himself and enters it in a much larger academic discussion. O’Reilly had the assistance of Martin Dugard who is an author and a running coach. So what happens when a scholar of the bible, biblical history, theology, or other disciplines challenges the assertions of Bill O’Reilly? O’Reilly invites her on his show so he can talk more about himself. Just minutes after his performance, menacing self-professed Christians come out of the woodwork like carpenter ants eating their way through liberal scholarship. Even if Jesus’s actions had been all about taxes, he died protesting a skeletal taxation system that privileged the rich. Wealthy citizens were exempt from most taxes altogether, non-citizens paid a flat-rate poll tax regardless of income, the property tax was 1 percent, and the money from taxes was used to build roads and fund the military. It’s not like the Romans did anything obscene like tend to the poor. In an interview O’Reilly recently staged with Moss, he follows this pattern. He sets his terms and forces them to work for him and against the other person. O’Reilly dismisses her before we even see her. “This woman” is about as gendered a dismissal as one can hear. Here is a way to make this clearer. “This black man…” Her gender is irrelevant to her academic credentials and arguments against O’Reilly’s. Moss is also a full professor who teaches New Testament and Early Christianity who is in the Department of Theology at Notre Dame. There is a significant distance between her rank and that of an instructor or “teacher,” which as O’Reilly’s tone suggests is not all that credible. By asserting his focus on history he dismisses her by saying she teaches theology. Therefore, what she has to say about his book is irrelevant. It does not matter at this point if he is a lousy historian, which the very words he uses about his book demonstrate, he is simply better than her. Bill is also a lousy theologian and he knows it which is why he limits the terms to his “history.” Theological decisions have been made about the texts from writing to canonization to translation. It is quite laughable he goes on to say that Jesus cares about the soul not politics. How is that not a theological claim? Theology, politics, and religious structures were all combined for centuries before and after Jesus. You just can’t have a history about Jesus without making theological judgments. 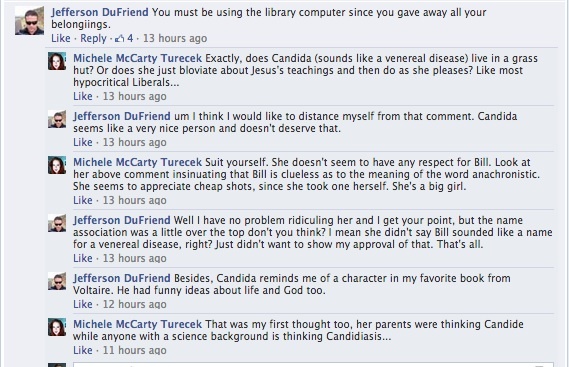 Bill’s theological judgments are weak, he knows it, so he dismisses it. Nor did she ever say that Jesus was a socialist but for that of a retweet of Reza Aslan! But with Bill’s set up, Moss may as well have not been on the show. That one sentence quoted above is all that outlets like Town Hall need to work the conservative angles in order to keep the liberal-shaming engine running. But it gets worse. It is the reaction and dismissive tone towards Dr. Moss that left me feeling disgusted and a bit ashamed. The amount of comments that dismissed her scholarship, demeaned her femininity, likened her to a sort of infection at Notre Dame, spoke as if she knew nothing about the bible, and so forth are troubling. Not just the amount, but the quality of these posts by those who profess a Christian faith is disturbing. No Christian should tolerate such transparent derision towards another human being with a different perspective. As if this is not bad enough, the capper is likening her to a yeast infection. The rhetorical strategy of O’Reilly and his ilk is to fabricate “liberal” as some menacing evil. By leaving out details and dismissing others, they craft a narrative that is made virtually impenetrable by loud voices and media sales. The anti-intellectual mindset of the audience they continue to create only buttresses the defenses and gives just enough reason to wage war against other ideas and perspectives on just about anything. In the end, to many, Bill O’Reilly’s Jesus is the only reliable picture of Jesus since all others come from the liberal academic society – a society that only has a political agenda. And our society continues to get dumber and meaner as a result. ← Religious Colleges: Promise or Peril? I love how he thinks he can hang on theology with someone who has a PhD in the New Testament. I also loves how he totally twists the teachings of Jesus by “disagreeing” that Jesus teaches us to help the meek and the poor. I would actually like to read the book–but only if I find a copy on the side of the road. I hear you there. The comment that politics was not a concern of Jesus is just a lie. The same goes for many who say that religions was not his bag. Both were! The overturning of the tables was a Temple cleansing that covered both of those bases.